Who doesn’t love chainless foundations? I, for one, hate crocheting hundreds of chains at the beginning of projects. I love crocheting, and doing math, but for some reason I hate counting those chains (anyone with me here?). 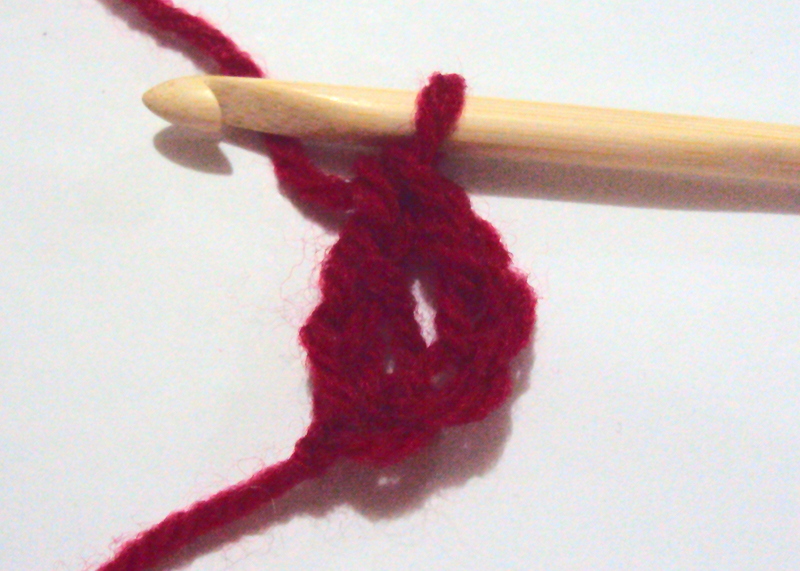 Enter: the foundation single crochet (fsc). But what if the base is made up of double crochet (dc)? This tutorial shows you how to do the foundation double crochet (fdc) step by step. As with all other tutorials here at Crochet Spot, mousing over the images shows the photos for the left-handed tutorial. Yarn over, insert hook into 4th chain from hook (the first chain made). 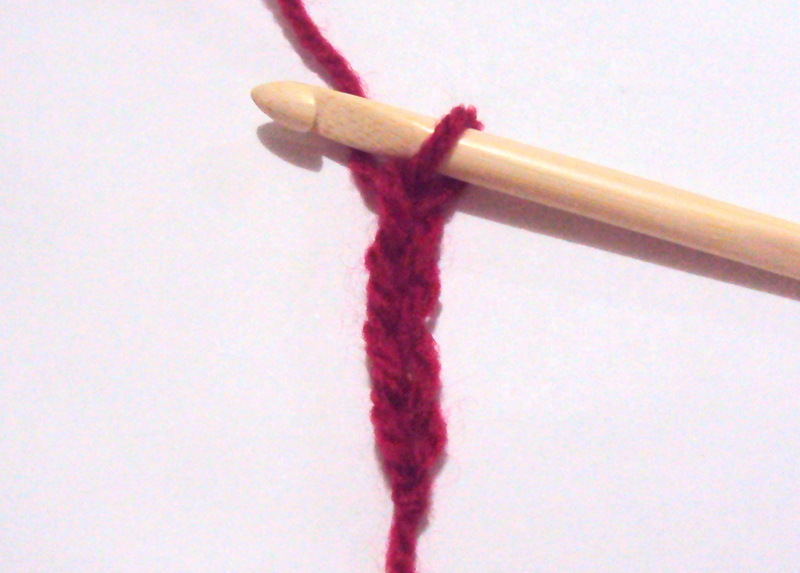 Yarn over, pull up a loop–a total of three loops on hook. Yarn over, pull through first loop (one chain made). 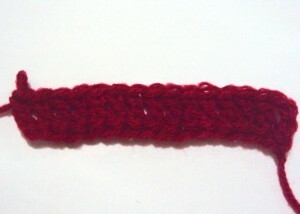 From this point, we’ll complete the stitch like a normal double crochet (dc) stitch. Yarn over, pull through two loops. Yarn over, pull through two loops. Congratulations, you just made one fdc! Yarn over, insert hook into chain one made in first fdc. 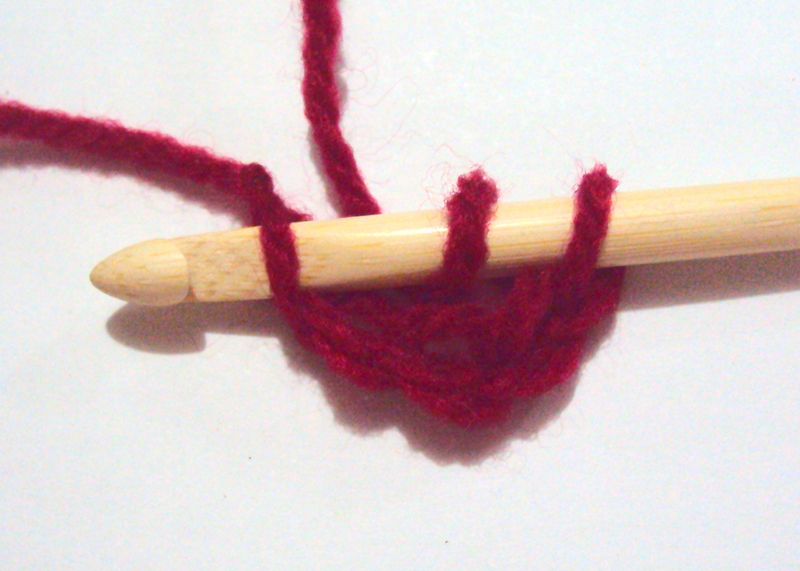 Yarn over, pull up yarn–a total of 3 loops on hook. Yarn over, pull through one loop–chain one made. (Yarn over, pull through two loops) twice. Second fdc made! Continue working like so until you reach the required number of base dc stitches for your project. One pattern you can use this technique for is my Royal Scarf (for the first row, make 217 fdc). I hope that was helpful! Let me know if you need anything by leaving a comment below. This entry was posted on Sunday, March 27th, 2011 at 12:00 AM by Claire Ortega-Reyes	and is filed under Tutorials and Help. You can follow any responses to this entry through the RSS 2.0 feed. You can leave a response, or trackback from your own site. Wow! And, thank you! 🙂 The fsc has been a standard part of my arsenal since I learned it here on Crochet Spot – it is so much easier than working back into chains, and maintains a more even tension (at least for me, since I chain too tightly). I can’t wait to test the new the “big brother” fdc out! I’m sorry, Claire, but I’m a little confused. You’re saying the DC is the foundation row. So, am I still chaining the amount of chains I need and then turning my work and DC across? Or do I keep chaining four and DC into the first ch. over and over? I guess what I’m saying is this: for the Royal scarf, you said to make 217 fdc. Is that chaining 217 and then turning your work and DC into each ch., or like I said ch. 4 and DC into the first ch.? Wow, this is great! I actually just started a pattern that uses this, and this is reaaaally helpful :). Thanks! Thank you so much. I could not figure this out because no one showed it from the left handed point of view! Thank you! I just love this stitch. After the first 10 or so, I could see where I was not being consistent on which strands of the chain I put my hook through, so now I’m good to go. I really prefer this to a long chain and then crocheting back into it. The “chains” of this stitch look so much more uniform when I look down the edges. I do have one question, though. Does the first chain 3 count as one of the double crochets? It looks to me like it should, but I’m not sure if I should count that as 1 or start with the next stitch. Hi Lee! I count it as one dc, but others might not.. It all boils down to what you think looks good. 🙂 Happy crocheting! Hi Fran! The foundation chain is the base on which we crochet, so yes it’s like a normal chain. Stitches like the foundation single crochet (fsc) and the foundation double crochet (fdc) eliminate the need for the foundation chain, that can require making a big number of chains, specially for big projects. Hope that helps! Please, please help me!!! 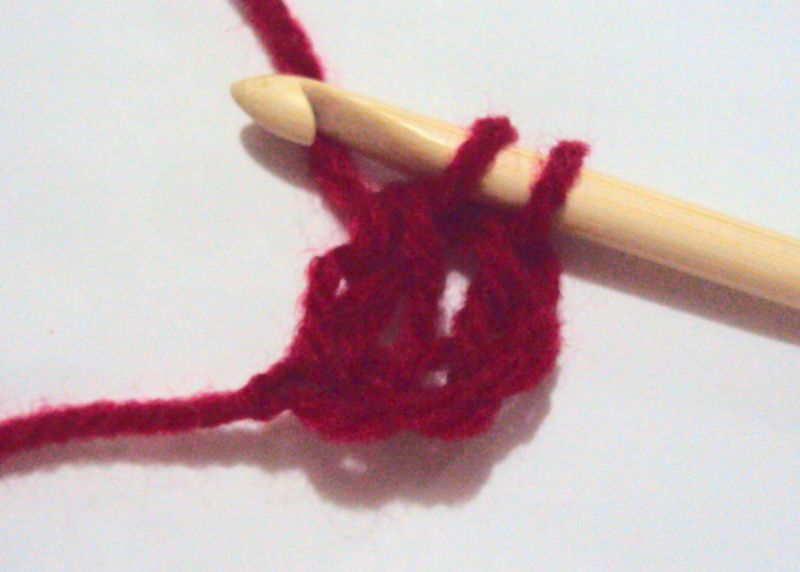 !, by explaining how to do Tunisian crocheting. I have cast on the first row of stiches, now how do I go on from here? I’m hoping to crochter baby cot blankets for an orphanage in Malawi, this should ??? be the easy and quickest way I think? If you already have all the loops on your hook, start with step 9. 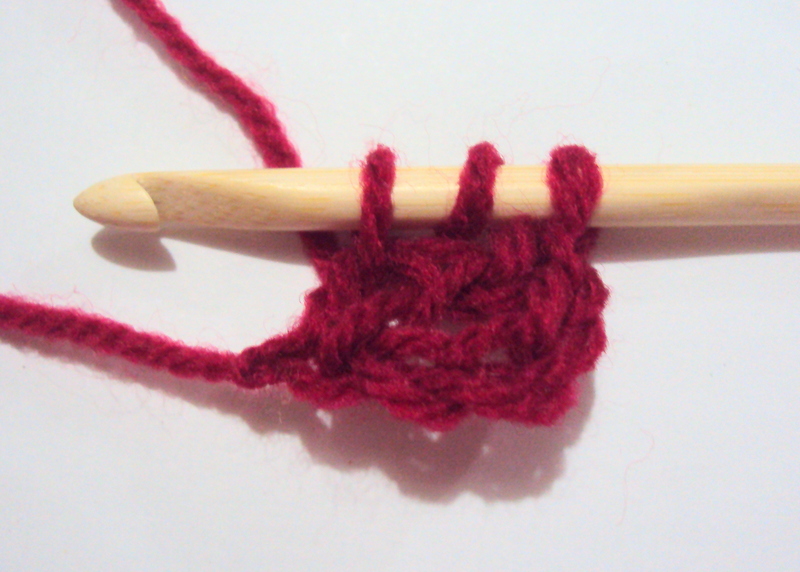 I just used this method to do a half-double crochet foundation. It makes a lot of sense, and I don’t have to fight with a starting chain. Since the start looks like the end, it makes it really easy to “crochet evenly around” to put the edging on. This tutorial is just fabulous. I heard of this technique years ago, but Crochet Spot is the first place I found instructions that don’t cost an arm and a leg. I am so pleased with the results. Thank you, Rachel. Even for as long as I’ve been crocheting, the info on your site has enriched my knowledge and improved my end results. Last, but not least, I am enjoying the generosity with which my fellow crocheters share information, resources, and ideas. Oh, I get it now. It might have been a good tip to start off with “this grows the opposite way to a regular foundation chain (e.g. right to left for right-handed people). Following all directions to the letter, but getting a curved result. The step of “insert hook into chain one made in first fdc.” is most likely the culprit. Aicia, I had that same problem. 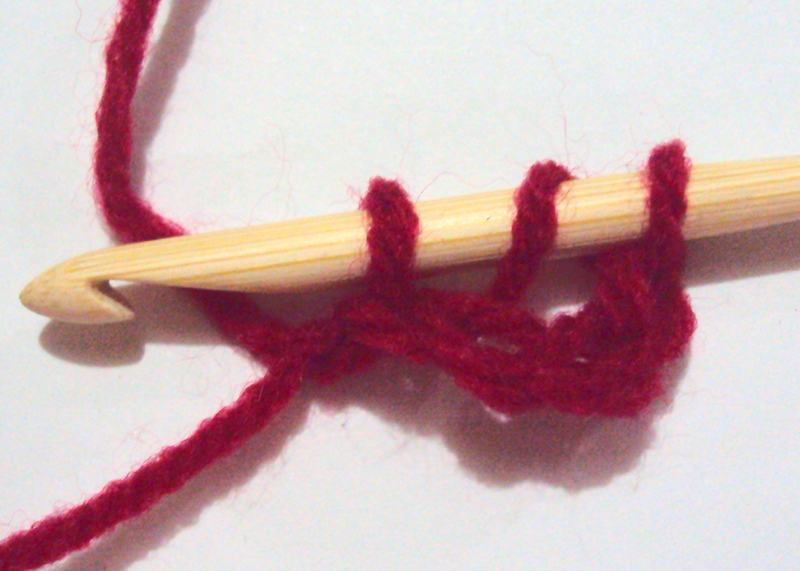 I find it helps if I use a stitch marker to mark my chain stitch, the one that happens when you pull through one loop. Make sense? It shows me which stitch to put my hook through for the next one. Thank you for publishing FDC (Foundation Double Crochet). Your instructions are clear and very easy to understand. Photographs are really helpful. Your visual aids are always presice and very helpful. Your tutorials are so clear everyone shouldn’t have much trouble learning whatever you’re teaching. You are the best. If I am following a pattern that calls for 250 traditional chains and then DC crochet into the fourth chain for a total of 248 DCs at the end of the first row with a DC chainless foundation I would actually make a chainless foundation that consisted of 248 DCs? In other words, however many stitches the pattern says you should have at the end of the first row is how many stitches you make in the chainless foundation? Hi Katie, yes you are correct! You would make 248 foundation double crochets because you want to have a total of 248 double crochet. I’ve been using this technique a lot lately, and I just love it. Hi, when doing the FDC, it works, but my chains are tighter than my top loops. Does that make sense? It is tighter on the bottom than the top, so it curves downward. I have tried to make the loops bigger when I am making the chain, but it doesn’t seem to help. When I do the traditional way, I can chain looser (or use a bigger hook), and it all comes out fine. However, I am making a connecting piece for already-crocheted pieces (to connect them together) and I don’t know how many stitches it will need. So the chainless foundation stitches are perfect, except for the curve that I get. Excellent tutorial – it let me pick up the technique very quickly. Thank you! For some projects, you start by making a foundation chain of simple chain stitches (as in http://www.crochetspot.com/how-to-crochet-chain-ch/), then joining the two ends of the chain together to make a loop, and then doing double crochet stitches on that loop. 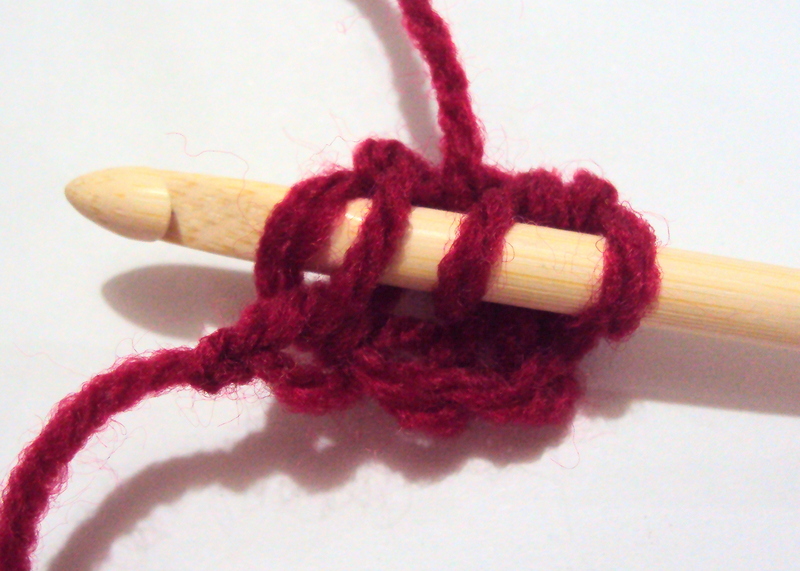 But if you wanted to start with foundation double crochet instead of a foundation chain, how would you join the first row of fdc to itself to make the loop? I’ve tried using a single slip stitch to join the two ends, but of course that leaves most of the height of the row unjoined. Hi Alys, on your last fdc stitch, after you do the first yarn over and insert your hook into the chain portion of the previous stitch, also insert your hook into the chain portion of the first fdc. Then yarn over and pull through both stitches so that it creates a slip stitch on the bottom side of the fdc’s. Then you can continue with the fdc as usual. When you’re done, make a slip stitch into the top of the first fdc to join to top of the stitches. I hope it works for you! Perfect! That’s exactly what I was hoping for. Thank you! This tutorial is well-writen and illustrated. I can now add another stitch to my crochet arsenal and it now makes it easy for me to do a foundation single crochet and other foundation stitches. Thank you!!! Thank you so much for this tutorial. I can’t tell you how many tutorials I have tried to follow to learn the no chain foundation technique, and this is the FIRST time that the explanation and pictures made sense! I truly appreciate your posting this . Thanks! Another grateful crocheter here! Thanks for your clear and concise instructions! I have been crocheting for 50 years and had never heard of a foundation double crochet or foundation single crochet until I printed a couple of patterns which used these beginning stitches. Thank you for your website. I now understand the procedures. Just wondering once the foundation chain is complete, do you then back track and dc in the ‘top’ stitches that have been on the top the whole time, or do you flip the foundation chain over and dc into the ‘bottom’ stitches? Hi Christina, you would work into the top. When you reach the end of the required foundation double crochets, is the extra chain (the “pull through one loop” part) necessary for the last dc since you won’t be adding another fdc into it? Hi Rachel. Thank You so much for your excellent tutorial. It’s always been a bugbear of mine to have to crochet into that first round of chains. Will be passing your website on to my friend who is a leftie. I’m a little slow at present but will improve with a little practice. It’s just so easy. Your double crochet is our treble. Thank you! I’ve wanted to learn this, but all of the video tutorials have confused me. Your step-by-step instructions are perfect! This was AWESOME. I’m making my 8yo daughter a balaclava, and I wanted a stronger foundation below the eyes then just a regular chain. This worked!!! I’m going to use this on future projects as well. THANK YOU! Hello, I am new to the art of crocheting and have only ever used a few basics like CH, SC, Double SC, and a couple TOGs. My friend taught me all these. I just want to make sure I am doing the FDC correct… It’s not looking like a square so much and I’m trying to make a hood/scarf. It requires about 100 FDC or so. So my main question is how do I continue on after making the 1st 2 FDCs? I tried turning it so I could continue like you would do if making a rabbit just using the FDC instead. But it turned out round. So am I supposed to make another CH 4 then do the FDC steps over again? I would also like to thank you for the instructions you post, A lot easier to understand! I live in Montana and will be leaving for culinary art schooling in Utah. I am going to bring my projects with me and if my hood/scarf is done I will wear it there! When you make 100 fdc, it should look like a long strip, like the very first photo on this page. After you work the instructions in this tutorial you’ll only repeat the last 4 photos/steps each time you want to add another fdc. No need to start from the beginning with the ch 4. How many foundation crochets chains, single, double or triple crochets do I make, if I’m suppose to chain say 166? For single do I make 165 or double do I make 164 or 163 and triple 163 or 162 when I do the foundation crochet chain. I’m new to the foundation crochet chain and I’ve practiced some and like it. I’ll be 81 next month and any help I would appreciate. Those long chains are a pain. I’ve been crocheting for about 60 years, mainly afghans. Thanks for your time. It really depends on the pattern and whether it is including the turning chain as a part of the beginning chain. If there is no turning chain, then you will make the foundation crochet chains the same number as the chain. If the pattern does include a turn chain (most likely), then you have to determine how many chains are a part of the turn. Normally sc = 1 chain, hdc = 2 chains, dc = 3 chains, tr = 4 chains, but this can vary depending on a pattern. So you would subtract the turning chain from the total number of chains. Thank you so very much for your reply to my question about foundation crochet chains. I really appreciated it. Yes, you can join the beginning/end of the row together. You can make as many fdc as you like, then when you get to the last fdc, you’ll make a bottom slip stitch and a top slip stitch. 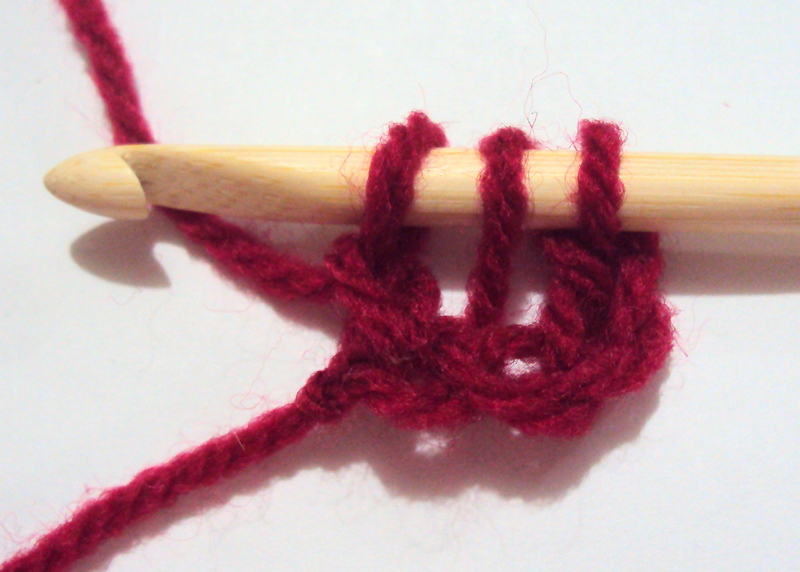 On the last fdc, after you insert your hook into the chain of the previous fdc, insert your hook into the chain of the first fdc too, then make a slip stitch to join them. Finish the rest of the fdc, and at the end slip stitch into the top of the first fdc. Thanks for this Rachel, can’t wait to use this on some head warmers I am making. Thank you! Finally a tutorial that makes sense the first time. I have tried to learn this and have never been able to figure it out. I even watched some You Tube videos and couldn’t figure out exactly where to insert the hook. In your tutorial you said the magic thing that made it clear – insert hook into chain one made in first fdc. I could see right away how this was making the neat edge that everyone was talking about and it finally made sense. I’m sure all the instructions were doing this but they were not spelling out exactly where to insert the hook so it made sense to me. Thank you for this clear tutorial that even I could understand. I am not even a new crocheter. 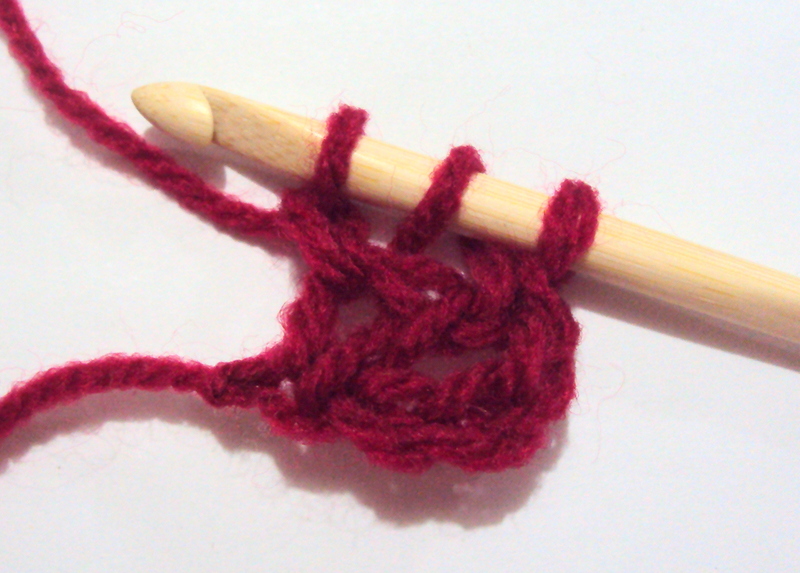 I have been crocheting for 40 years but I just could not figure out how to do this stitch until now. After you crochet the double crochet foundation chain how do you join it to make a ring to continue on with the next row? You can make as many fdc as you like, then when you get to the last fdc, you’ll make a bottom slip stitch and a top slip stitch. On the last fdc, after you insert your hook into the chain of the previous fdc, insert your hook into the chain of the first fdc too, then make a slip stitch to join them. Finish the rest of the fdc, and at the end slip stitch into the top of the first fdc. ok I still dont get it so can I just use a foundation row and then go over and do a row of double crochet if I dont get this fdc? Hi Alice! Yes, you can use a chain and then double crochets on top. Hello, I’m left-handed and trying to do the fhdc. My mom was right-handed she is the one that taught me to crochet. My problem is that when I watch the video I don’t wrap my yarn over the same way. I’m getting very confused. I don’t know if anyone can help me or not. PLEASE HELP ME!!!! You can use this tutorial for the fdc and view it with the left handed photos. It is really easy to go from fdc to fhdc. In the tutorial where it says “From this point, we’ll complete the stitch like a normal double crochet (dc) stitch. Yarn over, pull through two loops. Yarn over pull through 2 loops.” you will do “yarn over, pull through all 3 loops on hook” instead to complete a hdc rather than a dc. Hi! I’ve just finished a row of foundation double crochet stitches. I am entirely new to crocheting. So now I’m at a point where I need to turn to start the next row. I have three loops left on my hook and I am incredibly confused and unsure of how to continue. Any help would be very appreciated! 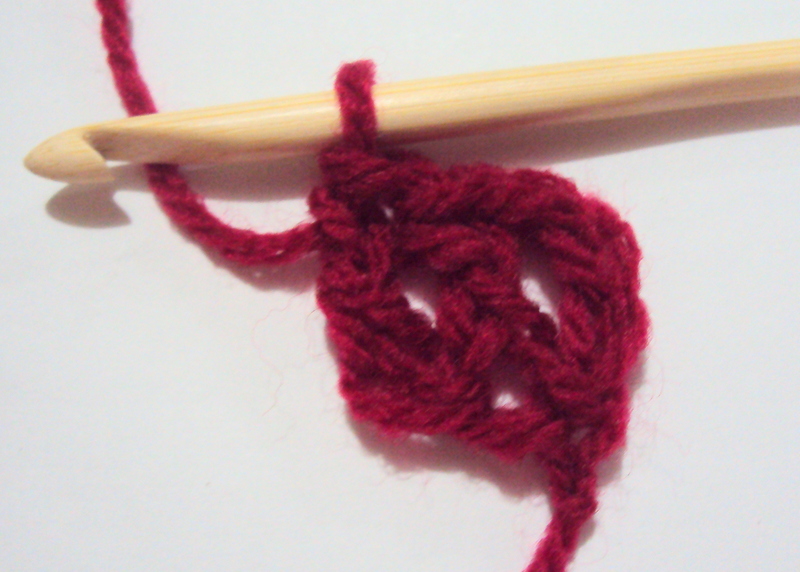 It sounds like you are in the middle of making your last foundation double crochet stitch. Take a look at the last couple of photos in this tutorial, to complete your stitch. You will only have 1 loop on your hook when you are done, just like in the last photo. Hi, i read this because of a pattern of yours im doing, the doll circle vest? Im confused at the part that says “skip 3 hdc, 6 fdc,….” does that mean when i skip 3 ch, i crochet 6 fdc unattached? I think the step after that is ” one LDC into next st. So do i put the ldc into the 4ch or 9th ch? and am so glad there is finally a chainless pattern Thank you. How do you join foundation double crochet to work in the round?